The railway station at Bailey Gate was located in the county of Dorset at the southern end of the 'main line' of the Somerset & Dorset Joint Railway (S&DJR). The southern part of the S&DJR was constructed originally by the Dorset Central Railway (DCR) as a single-track line running north-westwards from Wimborne to Blandford, but later the line through Bailey Gate was converted to double-track. 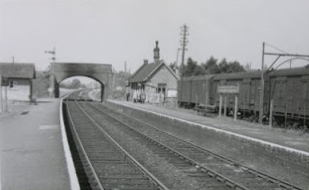 When the station was opened on 1-November-1860 it was named Sturminster Marshall originally, but in 1863 it was renamed Bailey Gate after the turnpike gate on the nearby main road. (The renaming was done probably to avoid confusion after a new station opened at Sturminster Newton when the DCR extended northwards from Blandford.) Bailey Gate was the first station north of Wimborne and had Up and Down platforms, with a goods yard on the Down side behind the station and another siding on the Up side. Adjacent to the goods yard was a dairy, which provided regular milk traffic to the railway throughout its existence. A local road crossed the railway by an over-bridge No 220 immediately to the north of the platforms. 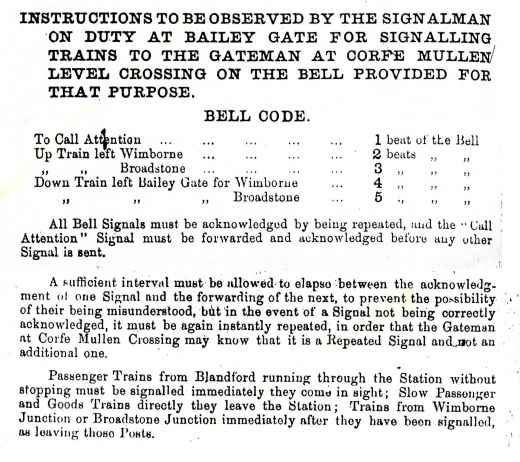 The earliest known reference to any signalling at Bailey Gate is a mention in the Minutes of the S&DJR Officers' meeting on 8-November-1876 (National Archives (TNA) file RAIL/626/16) of the decision to provide a signal-box there. Minute No 389 stated "Box to be fixed at the Wimborne end of the up platform at Bailey Gate and signals worked from it. Points to be bolt-locked. Estimated cost £130". At that time there was probably only a limited number of passing-loops on the ex-DCR single-line (see the RailWest page on S&DJR Early Signalling), but the reference to 'up platform' would seem to imply there was already a passing-loop with separate Up and Down platforms at Bailey Gate. It is probable also that Bailey Gate was equipped with a number of disc-and-crossbar signals at that time, as the late CR Clinker records (from an unknown source) that all such signals were replaced by semaphore signals on 10-February-1879. 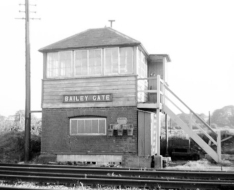 Clinker recorded the same date from S&DJR Signalling Instruction No 30 (of which no copy has been sighted yet for confirmation) for the opening of a new signal-box (SB) at Bailey Gate, which the Signalling Record Society lists as containing a 20-lever interlocking frame. At that time the single-line block sections Blandford - Bailey Gate and Bailey Gate - Wimborne Junction would have been worked by 'block telegraph' without any form of physical train staff. S&DJR trains originally had to reverse at Wimborne in order to run over the London & South Western Railway (L&SWR) to Bournemouth. To ease this problem a new 'cut-off' line was constructed eventually, which left the S&DJR route at Corfe Mullen (about 2 miles down the line from Bailey Gate) and ran south-eastwards to join the L&SWR at Broadstone Junction. Known officially as the ''Poole & Bournemouth Junction Railway", the new line was brought into use for goods traffic in December 1885 and for passenger traffic in November the following year (1886). 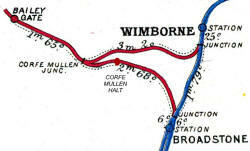 Although the actual divergence from the ex-DCR route was at Corfe Mullen there was no physical junction there; instead the Wimborne and Broadstone lines continued north-westwards as parallel single-lines as far as Bailey Gate, where the actual junction was made at the south end of the station. Bailey Gate then became an important location in controlling the passage of trains onto or off the southern end of the S&DJR. It would appear from map evidence and instructions in surviving S&DJR Working Timetable (WTT) Appendices for the 1886-1905 period that the original SB was superseded circa-1885 by two new SBs known as the 'Station' and 'Yard' boxes. The 'Station' box was situated on the Up side of the line between the Blandford end of the Up platform and the road over-bridge, whilst the 'Yard' box was located on the Up side mid-way between the two sets of junction points at the Wimborne end of the station. (Click here to see the relevant instructions for these two boxes from the 1889 WTT Appendix.) However the various WTT Appendices details would suggest that only the 'Yard' box was a 'block post' controlling the single-line sections, with the 'Station' box being merely a ground-frame (GF) to work the points at the north end of the station. (Because of contemporary Board of Trade restrictions on the distances for the mechanical operation of points, it was a feature of some S&DJR passing-loops at various dates for the points at one end to be worked by a GF locked from the SB.) 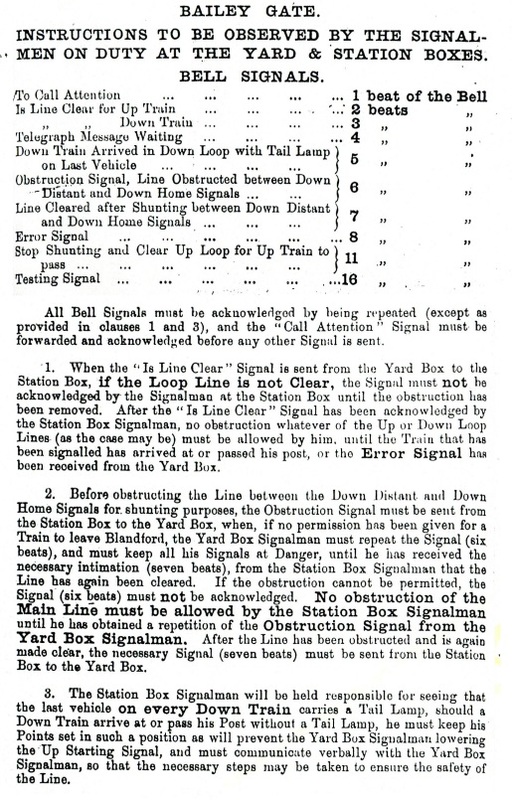 Based on evidence from a later 1900 signal diagram (see below), it would appear that the 'Station' box was probably little more than a small ground-level hut with only a few levers; it is assumed that the 'Yard' box was a typical two-storey box, but it is unclear whether it was a new structure or simply the relocation of all or part of the original SB. The new line to Broadstone was the first single-line section of the S&DJR to be worked by the Electric Train Tablet (ETT) method (being so listed in the WTT Appendix 7 dated 1-March-1886) and used Tyer's No 1 ETT instruments. On 4-November-1886 the same method of working was introduced on the single-line sections to Blandford and Wimborne Junction (S&DJR box) to replace the previous 'block telegraph' system. It is presumed therefore that the ETT instrument for the single-line section to Blandford was housed in the 'Yard' box along with those for the sections to Wimborne Junction and Broadstone. About 1¼ miles down the line from Bailey Gate was Bailey Gate Crossing and just under a further ½ mile beyond there was Corfe Mullen Crossing, both locations having crossing-keepers and gate-boxes. Prior to the subsequent opening of a new signal-box at Corfe Mullen Junction in 1905 (see below) it was the task of the signalman at Bailey Gate (presumably in the 'Yard' box) to inform the Corfe Mullen crossing-keeper of the approach of any Up or Down train on either line by means of the appropriate code on a warning bell. 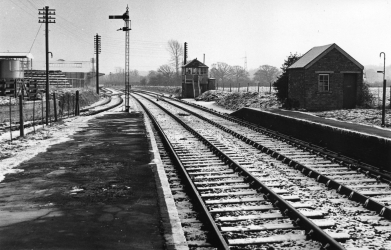 A 'repeater' bell was provided on the same circuit at Bailey Gate Crossing so that the crossing-keeper there could be made aware at the same time. Click here to see the appropriate instructions from the 1889 WTT Appendix. 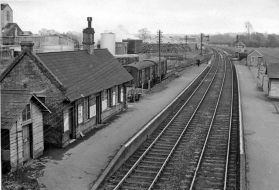 In 1900 a new temporary contractor's siding was provided at the north end of the station in connection with preparatory work for the doubling of the line to Blandford. This siding was on the Up side of the line, but accessed by a connection which crossed the end of the Up loop and trailed into the Down loop. The new siding was inspected for the Board of Trade by Major Pringle, whose report dated 18-October-1900 is in TNA file MT6/971/9 with the diagram shown below. The old 'Station box' GF was utilised to control the new siding connection and its shunt signals, whilst in the 'Yard' signal-box a new lever 'A' was added to the left-hand end of the lever-frame to act as a release lever for the new siding. The new double-track to Blandford (together with a new signal-box at the intermediate station at Spetisbury) was brought into use the following year (1901). The new Up line replaced the former contractor's siding and all the pointwork by the road-bridge was replaced by a trailing crossover between the new Up and Down lines, with ground shunt signals at each end. A new Up Advanced Starting signal was added (worked by lever 15) and a treadle 'A' was provided some distance in advance of it to release a back-lock on lever 15 (there is more information about back-locks in the RailWest page on S&DJR Sykes Instruments). ETT working between Blandford and Bailey Gate was abolished and the new double-track sections Blandford - Spetisbury - Bailey Gate were worked by the standard S&DJR block telegraph. At some unknown date between 1901 and late 1904 the 'Yard' SB at the junction was replaced by a box located on the Up side of the line some distance south of the Up platform (not in the same position as the 1879 SB). Points 9 were moved further south to make room for this new SB, but the capacity of the siding was maintained by extending it further southwards through the site of the former 'Yard' box. In its new location the SB was able to work the crossover at the Blandford end directly, so the 'Station' GF was abolished; lever 'A' was re-used to work the crossover and an additional lever 'B' was added to work the associated ground signals. (This was a push-pull lever, which stood normally in a mid-way position; pulling the lever back worked one signal, pushing the lever forward worked a different signal.) The revised layout can be seen in a diagram on page 86 of the OPC book , although it is labelled erroneously as being for the period from 1885 onwards. The OPC diagram shows also the addition of two more push-pull levers (Nos 21 & 22) to control new ground signals for the existing sidings, but the precise date for that change is not known. All known photographs of a signal-box at Bailey Gate show a S&DJR Type 1 box in the post-1904 location. A Type 1 box would be consistent for a construction date of the late-1870s, whereas a Type 2 style would have been expected for a new 'Yard' box in 1885, or even a Type 3 structure if a new construction at the station circa-1901/04. The implication therefore is that the post-1904 SB re-used an older wooden superstructure on a new brick base, but it is a matter of conjecture whether that timber superstructure was from an older box at Bailey Gate or some other location. The lever-frame numbering in 1904 equated to that of the 1900 layout modified by known subsequent changes, so it would seem a reasonable assumption that the lever-frame from the 'Yard' box was re-used. In 1905 a new physical junction was constructed between the Wimborne and Broadstone lines at Corfe Mullen and a new Corfe Mullen Junction signal-box was opened there on 16th April that year. The junction at Bailey Gate was abolished and thereafter the two lines from Bailey Gate to Corfe Mullen Junction were worked as ordinary double-track and controlled by the standard S&DJR block telegraph for the new block section Bailey Gate - Corfe Mullen Junction. (It may be assumed that the two ETT instruments at Bailey Gate were transferred to the new signal-box at Corfe Mullen Junction, as the latter now controlled the single-line sections to Broadstone and Wimborne Junction.) Facing crossover points 12 were removed, together with the associated Facing Point Locks 13 and 14, and also the redundant Down 'to Broadstone' signals (5, 6, 7, 8). In the Up direction the actual redundant 'from Wimborne' signals 17 and 18 were removed also, but their levers were re-used for the remaining Up Home and Up Distant (previously 19 and 20). The Down Advanced Starting signal (4) was renewed as a single straight post some distance further towards Corfe Mullen, and ground signal 21PUSH was relocated to the Down line end of crossover 11. The diagram below is taken from TNA file MT6/1373/4. After the removal of the junction in 1905 the basic layout at Bailey Gate remained unchanged for many years, except for some minor alterations such as the relocation of the Up Home signal (17) about 50 yards further from the signal-box on 28-March-1915 (S&DJR Signal Instruction 248). Indeed a 1930 copy of the signal diagram shows the installation still to be essentially the same as the 1905 arrangements. However on 24-March-1932 (S&DJR Signal Instruction 322) a new 'Down Siding No 2' was provided, which was connected to the existing Down Siding (now renamed 'Down Siding No 1'), and this new connection utilised levers 12 and 13 for its points and ground signal. At some unknown date between 1932 and 1955 one of the pair of ground signals worked by lever B PULL was removed, with the remaining ground signal being used to control both routes. On 14-December-1952 ground signal 22PUSH was moved from outside the Up line into the 'six-foot'. In 1955 an additional 'United Dairies' siding was provided on the Down side, but this had its own separate connection to the main running line; for this alteration levers 14, 19 and 20 were brought into use for the new points and ground signals. The station was closed to general goods traffic on 5-April-1965, although the milk traffic continued. On 3-May-1965 the Up Siding was taken out-of-use, points 9 were disconnected from the lever-frame and clipped and padlocked, and signal 22PULL was abolished (Weekly Notice P/EW16). On 6-March-1966 passenger services ceased on the whole of the S&DJR and the station was closed to passengers. Although most of the S&DJR was now closed completely a few sections remained open for goods traffic and this included the line from Broadstone as far north as Blandford. 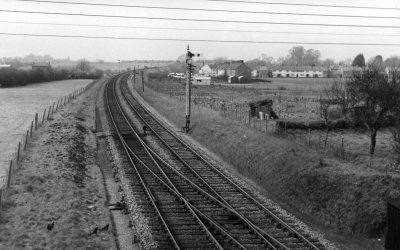 During 1966 the Up line was taken out of use and the Down line was worked thereafter as a siding for traffic in both directions. The arms and lamps were removed from all the signals and white marker lights provided on the posts of the former Distant signals (1 and 18). The signal-box was reduced to ground-frame status and all its levers were taken out of use except for 10 and 14, which controlled the two remaining sets of siding points. Down Siding No 1 was clipped and padlocked out of use and the trap-point at the exit from Down Siding No 2 was connected to lever 10 instead of 12. Warning boards worded 'STOP DO NOT PROCEED WITHOUT PERMISSION' were erected at each end of the revised layout to face approaching trains. Various dates have been quoted for this work, but according to Weekly Notice P/EW27 it took place on 24-July-1966. The ground-frame was closed on 7-May-1968 and the last remnant of the old S&DJR line in Dorset was closed finally on 6-January-1969. All traces of Bailey Gate station have disappeared now under the development of an industrial estate. The road over-bridge has been removed, with a new roundabout built on the site, and the trackbed northwards has been obliterated by a housing development. Introduction station photographs courtesy Keith Pfrangley collection, 1960s photographs John Eyers collection South Western Circle, signal-box photographs WCRA collection.